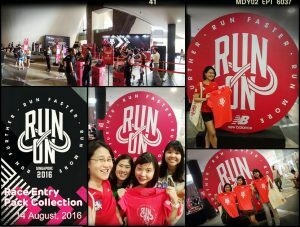 Race Review: New Balance Run On 2016 [7km + 1km] (by Rebekah Ong) | JustRunLah! 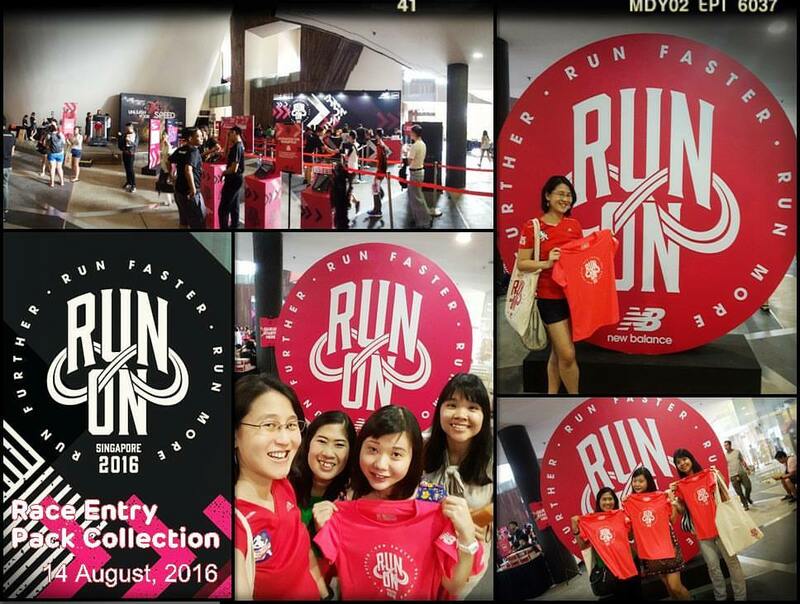 Fun was definitely the word to describe this year New Balance Run On SG event! 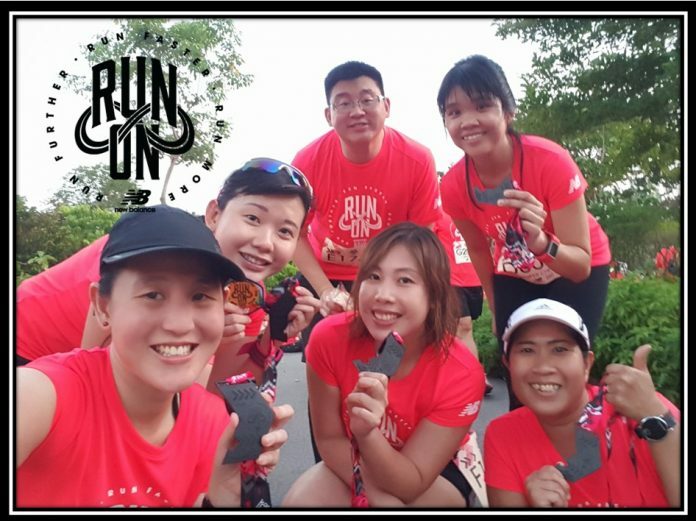 The race distance for the event was 7 km but participants have the option to RUN ON one extra kilometer on race day, and earn themselves an exclusive NB Run On Achievement Badge! I joined last year and I couldn’t wait to add on to my collection of New Balance Run On SG unique race medals. I’m changing my review style to highlight the things that I loved about the event and things that I thought could be done better. Organised collection process – I went on a Sunday afternoon after lunch with 3 of my close girlfriends. We didn’t need to queue at all. The volunteers were quick and efficient and knew what they had to do. They quickly got our items for our race pack, asked us to verify the name stated on both the race bib and timing chip. 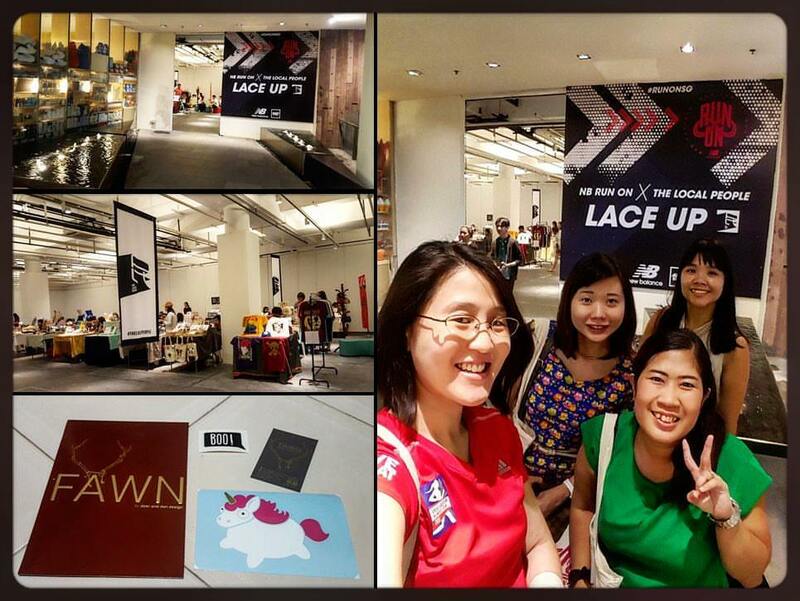 They also remembered to offer us a lucky draw to see whether we can win for ourselves a pair of new Vazee Rush or Vazee Pace shoes, but alas, both my friends and I are never lucky for lucky draws. Free Silk-screening – Big thanks to the people at The General Co. for silkscreening our race tees!! I always look forward to the cool designs that you guys have. 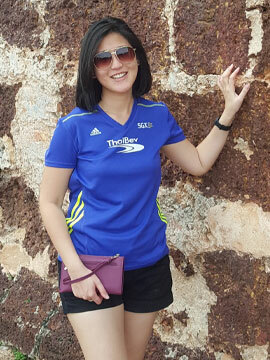 This year I chose “IT NEVER GETS EASIER, YOU JUST GET STRONGER, #RUNONSG”. My friend Cheng Yee chose the same design too. We really liked this tagline because running is never easy, and you got to do it consistantly in order to get stronger and better! My friend Kalsom and Jennifer chose “RUN SHIOK SHIOK”! That is one funny tagline! So Singaporean but who can deny the “feel-good” feeling after a run! I can certainly attest to that! 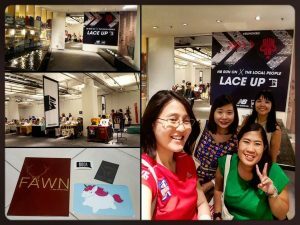 Fantastic idea to have a flea market (LACE UP) – Loved the idea on how NB Run On did a tie up with The Local People by orgainising this flea market! It was cool to see all the local designers products that were available! My friends and I stopped by the FAWN pop up store. They were selling Vinyl stickers which I thought were super cute! Most of us ended up buying the stickers from them. I bought a fat unicorn sticker which I’m going to paste on my luggage! 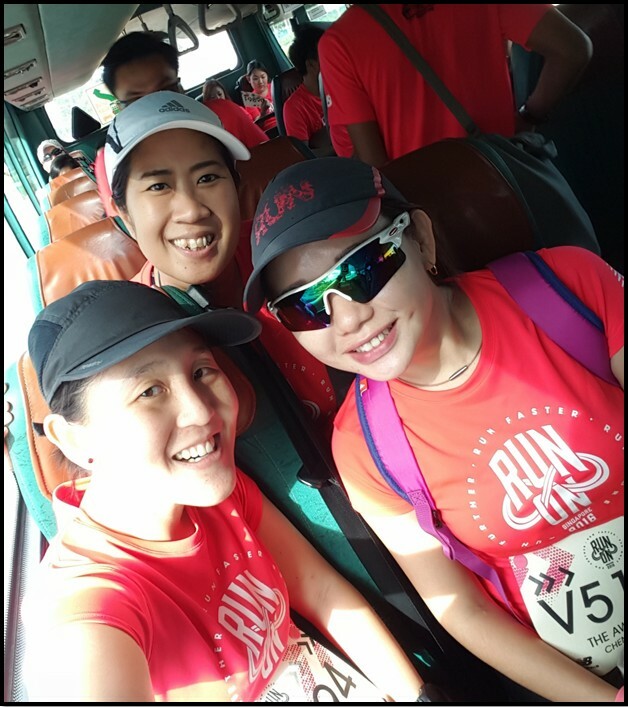 Thank you organiser for providing free shuttle services to the event site! That was a fantastic call because it’s so difficult to get there! We arrived at around 4 pm at Stadium MRT and didn’t have to wait long to board a shuttle bus to the event site. Intervals were very fast and we could see the shuttles leaving promptly and arriving really quickly. Volunteers did a good job in crowd controlling. Cool photo opportunities – I love how the organiser had cool props for the participants to take photos with! 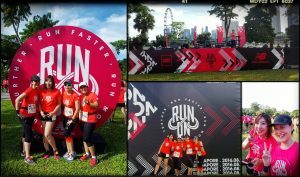 What’s a run event without having photo memories! Best part was that they had assigned volunteers at each station to help take photos! This makes it so much easier when taking group photos! Awesome host and music provided throughout entire event – Two thumbs up to Kimberly Wang, Elias Soh and DJ A/K/A ATTAGIRL. Kimberly and Elias entertained the crowd really well by charming us with their personality and also providing us details about the race and it was just nice listening to her talk! DJ A/K/A ATTAGIRL beats were so cool that they just made you wanna party! The combination of them just made the event really hyped! Check out the flag-off video! 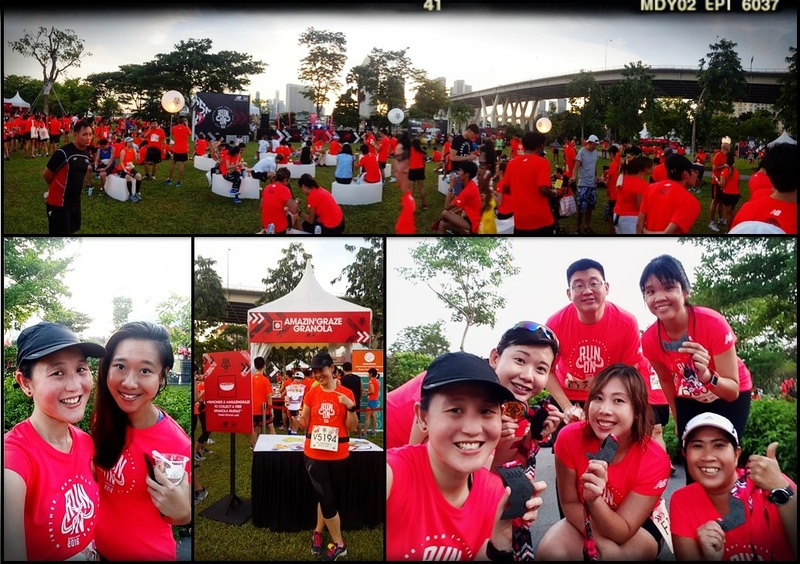 Nice Scenic race route and enthusiastic volunteers – Love how beautiful the Singapore skyline is. From the START pen and all way throughout the route where we ran past the Marina Barrage and Gardens By the Bay. We also got to see the otters when we were starting our run! 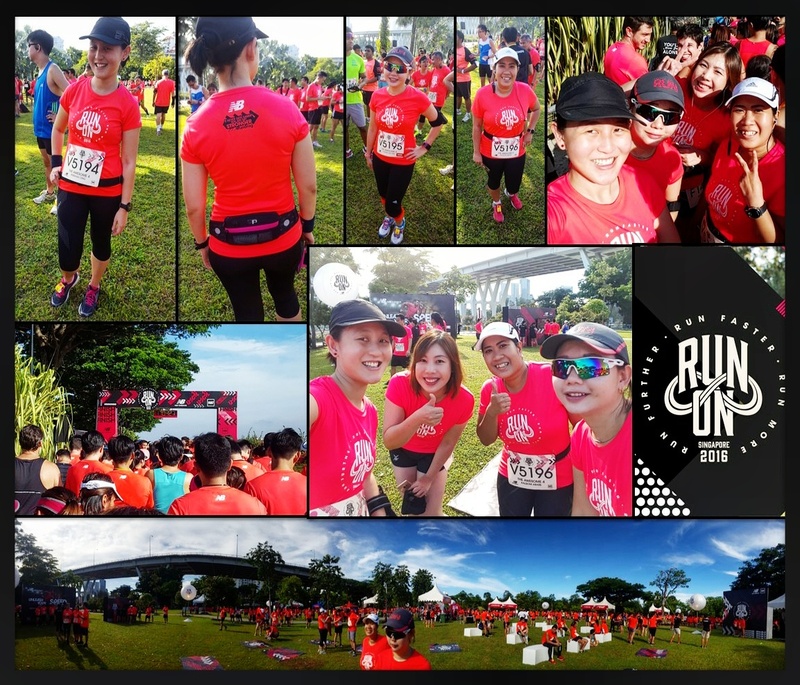 At my 2.5 km mark, I saw the first few runners coming back and that included some familiar faces like Mok Ying Ren, Shah Feroz and Colin Tung who were also participating in the race. Boy they were super fast and I can only dream of doing that pace. I excitedly cheered them on as they past. I did the extra 1 km and I gotta to say I was impressed with the volunteers who were at the extra 1 km because they were the most enthusiastic of all! 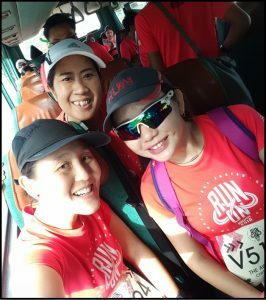 Their encouragement does play a part in motivating those who are already tired out from the 7 km to keep pushing. 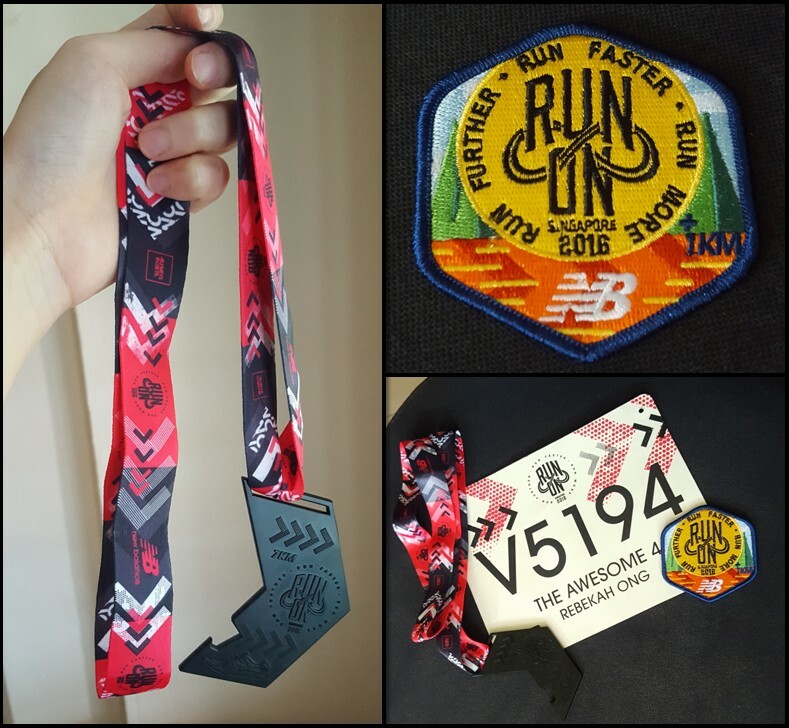 Cool finisher medal and achievement badge – I’m so glad that I completed the race in that scorching heat. It was definitely not an easy one to keep pace. It was great feeling to be rewarded with a nice medal and an achievement badge to mark the end of the race! 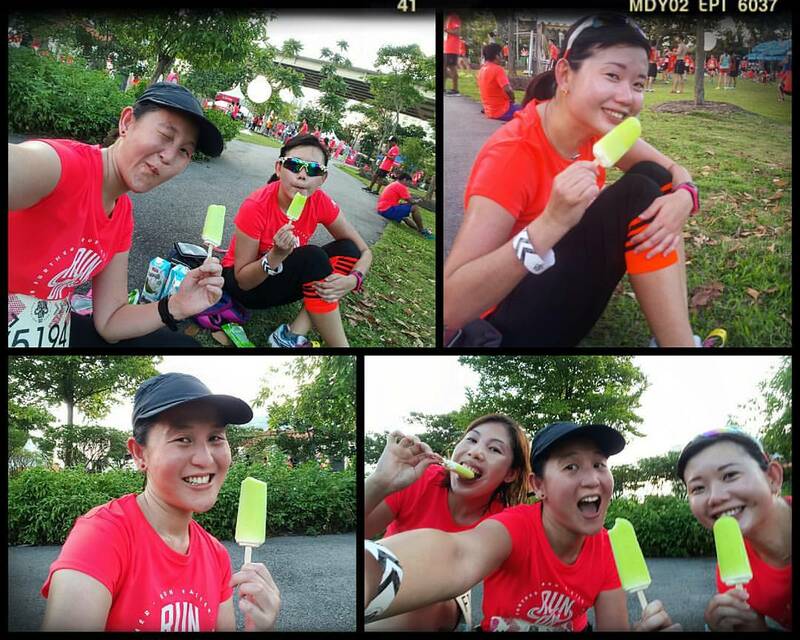 Fantastic post race refreshments – This is one of the main reasons why the NB Run On SG event is the best! Free flow of food everywhere! From beers to truffle fries, there were many more other fantastic refreshments like hot dogs, fish balls, ice-cream, yogurt etc. You definitely won’t grow hungry and you’ll be satisfied! Coconut water was given to participants to re-hydrate their bodies which had raced in the grueling evening heat! The weather was a killer! 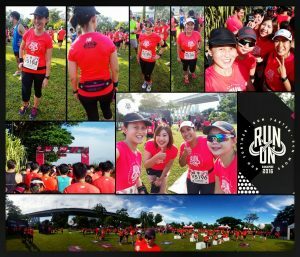 Cool post race contest – I like that the organisers catered for those who were there to just enjoy and not running competitively. I liked how they were running Instagram contest and giving out NB starter kits. Too bad I didn’t Instagram early enough because they had a cut-off timing at 18:30 hrs. Flag-off Timing to be reflected instead of event start time – This was one of the big things that I really didn’t appreciate. When you state 5pm is the START time, people would automatically assume that flag off is at 5pm. Most races would emphasise their flag-off timings rather than start pen open timings on their websites and race booklets. We would not go into the nitty-gritty of the race booklet to see the program schedule. So when I thought the start time was 5pm, my group and I headed to the starting pen early only ending up to be stuck there for another half an hour before flag-off! It was NOT a nice feeling because we got stuck in front of a speaker blasting the music and also because it was super hot that day!! We felt like sausages on a flaming grill!!! My only consolation was that I got to see Mok Ying Ren walk past while he was heading for the front of the START line 15 minutes before flag-off and he said hi!!! To bad I couldn’t get him to take a photo because it was soooo squeezy but it was really nice seeing him. Not enough hydration points – There was only one hydration point for the entire race! And that was only at the 2km/5km mark which was the Marina Barrage area. It was sooo hot yesterday that another hydration point at the U-Turn point would be a real treat but unfortunately there wasn’t. Maybe the organiser could set up an extra hydration point at next year’s event. 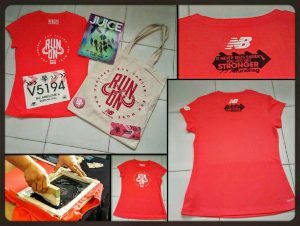 Not reflecting the race route accurately in the race booklet – Now we all know that NB Run On SG has a really fantastic design crew but the one thing they did not do was to reflect that we had to go up the Marina Barrage slope. In the race guide, they just drew a straight 90 degree turn which a lot of us would expect it to be flat ground but it was not. Run Events like the Performance Series did do so by highlighting the actual route and I appreciated that because having myself being mentally prepared, helps me plan how fast and how much effort I need to keep on going for my entire race. I’ve circled the area in RED that I was highlighting. Overall it was a fun event and I enjoyed every moment of it! I took a lot of photos and they will be memories that I keep! I’ll definitely look forward to next year event where we go the distance again. 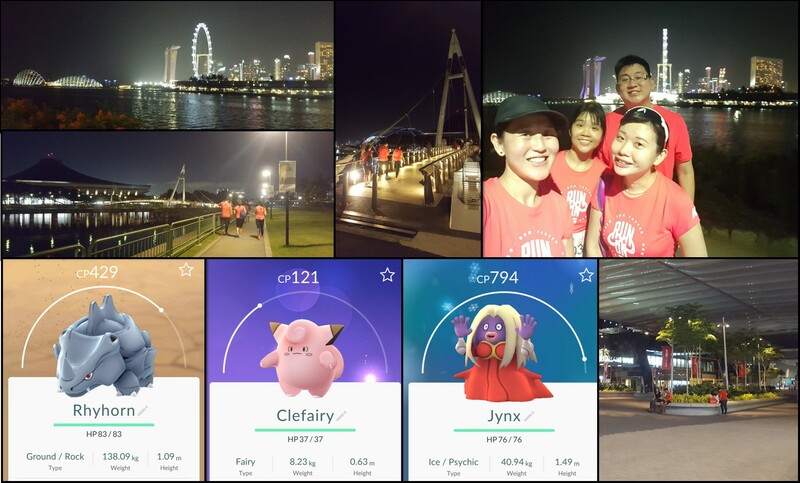 Interestingly, my group still had the energy after the event to go and catch Pokemon around the area! 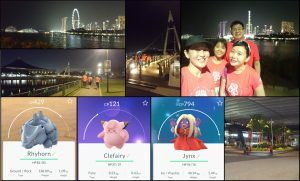 It was a fruitful ‘Pokemon’ing session! In total I managed to add these new additions to my Pokedex a Clefairy, Rhydon and 2 Jynxs! Till my next write-up! Stay healthy and happy! Nice review… Fun even and well organised, bit totally agree with your suggested improvements. I was stuck in the starting pen for 45 mins. Thanks for sharing.